Amidst the rugged crags and towering Rocky Mountains surrounding Banff, Alberta Canada, is some of the world's most beautiful horse back trails. Eighty miles west of Calgary, just inside Alberta near the British Columbia border, is some Banff National Park was originally set aside for protection in 1885. Banff, Canada's first national park, is the most popular of this country's 40 national parks and reserves, welcoming more than 4.5 million visitors annually. If you're closer in to Calgary, the area along the Rocky Mountain front near Seebe is known for its fertile ranch land and incredible horseback riding. Hop on and ride along the edge of the Great Plains, where it nudges up to the face of the Canadian Rockies. If you've ever thought about seeing the Canadian Rockies from horseback, Fresh Tracks will set you up with horseback adventures in some of the most breathtaking scenery Canada has to offer - which is saying a lot! Experiencing Banff's Canadian Rockies on horseback takes you back to the era of early explorers. Not to mention, Banff National Park's century-old ranches welcome guests to join in old-fashioned horseback riding with lodging in cabins and mountain lodges. For serious adventures, there are also a number of multi-day trail rides that take you deep into the backcountry of Banff National Park and surrounding frontier. Whether you decide on spending the night in a comfy rustic lodge or you decide to brave a few nights the true cowboy way (tent and fireside), your experience will undoubtedly be one you'll never forget. While riding through Banff National Park you'll see an incredible array of wildlife and remote mountain landscapes. Many ranches also offer part-day rides, with the option to combine your horseback riding adventure with a day of whitewater rafting or a hike to a wildflower meadow. At night, cheer on the broncs at a ranch rodeo and swing your partner at a square dance! Some of the best time of the year to come and see Banff on a horseback tour is between July and August. Remember to make sure and bring layers of clothing. Although it may be sunny, it can still be cool - especially in the evening. If you're planning to spend the majority of your tour camping, remember to also be on the lookout for bears and mountain lions. If you're planning a horseback riding trip through Banff National Park and the Canadian Rockies, let Fresh Tracks set you up with everything you need to make your horseback-riding adventure an unforgettable experience. 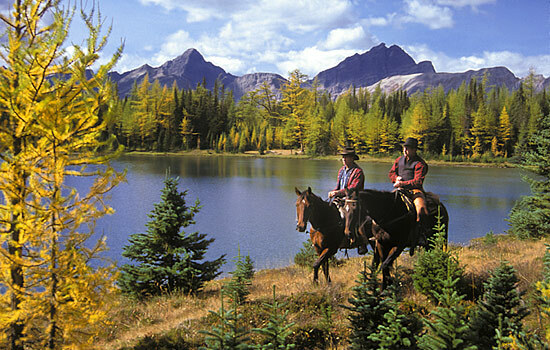 Need more information on Horseback Tours in Canadian Rockies? Talk to one of our Canadian travel Insiders who'd be happy to answer all your questions.